On Gratitude is the adventures of a schizophrenic recovering from tobacco who, ironically, is a chemical dependency counselor. This photo recovery book playfully works with recovery issues like unemployment, thinking errors, and addiction and shows that gratitude and humor, despite a psychiatric disability, are important in challenging the addictive logic of coyote, a powerful representation of addiction that can pull the rug out from underneath you when you are least expecting it. Jean uses a coyote stuffed animal with clients to represent the addictive beliefs and logic coyote represents to her. She has another doll that represents honesty and sobriety or “smobriety” (from cigarettes). When people want the cigarette or drink they can’t refuse—that is coyote’s logic and reasoning. In her own journey she asks, “what is the nature of that logic—what does the logic need and what is it hungry for—is there a different way to get that need met?” She challenges her own thinking errors with respect to cigarettes. Nicotine is a cunning, baffling and powerful logic. She calls that addiction coyote. Jean Marie Manthei is in recovery from tobacco for six years. She has worked as a chemical dependency counselor in Colorado Springs since 1993. 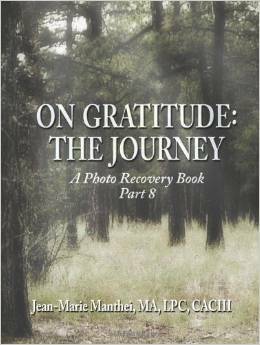 Jean was motivated to write this book to experience more positive outcomes. The pro-social aspect was that perhaps others would be inspired. There are positive outcomes—you have to create them.